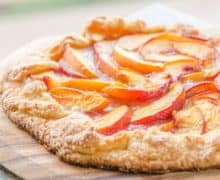 This Peach Crostata is an extra easy peach tart that can be made as big or as little as you want! Fresh peach slices are tossed in brown sugar, cinnamon, and rum, nestled into a free-form shaped pie crust, and baked into a rustic crostata. It’s a simple and delicious dessert! 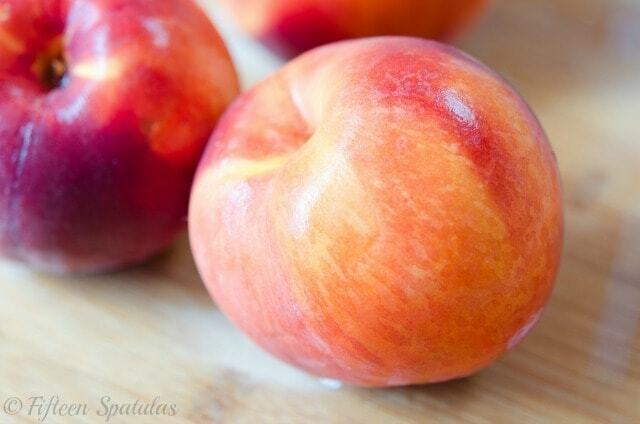 If you asked me what my favorite fruit was this summer, my instant answer would be…peaches! Is it just me or were they extraordinary this year? Some of the other quintessential summer crops seemed to have trouble (I only bought corn once this year, because I could never seem to find any decent corn), but the amazing peaches more than made up for any other troubled crops. I couldn’t stop buying them and eating them in every way possible. With glee. 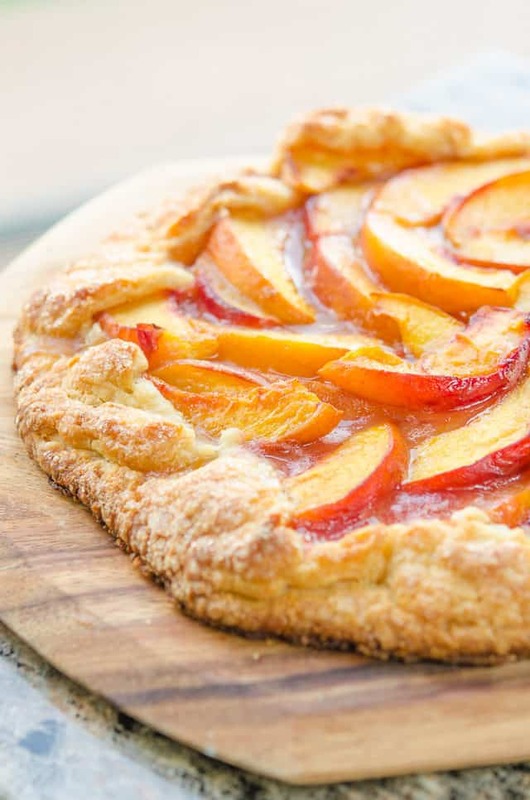 My favorite preparation of peaches is definitely this rustic peach tart. 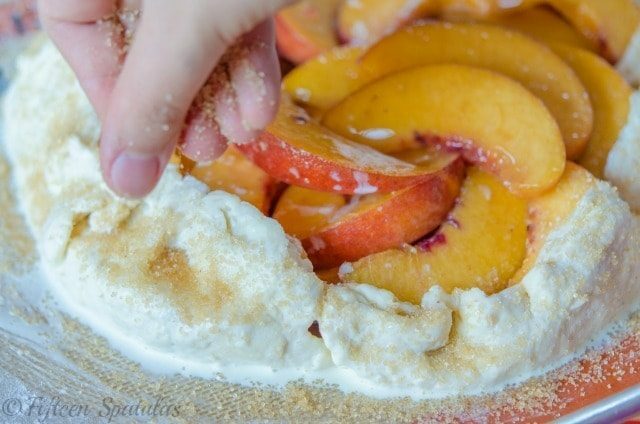 It’s one of the most beautiful ways to prepare peaches and still let them be the star of the dessert. Oh, and did I mention it’s unbelievably easy to make? Fold the edges up, brush the edges with heavy cream, and sprinkle with turbinado sugar. Its crunchy, coarse texture gives the crust an extra special crunch. No matter how gnarly it may look before it goes into the oven (which I showed you in the photos above), it always bakes up beautifully with a golden brown sparkling crust, and caramelized peaches set in their own juices. I recommend serving this tart with a big scoop of vanilla ice cream. The recipe is below, plus a full video to completely guide you through the cooking process. Enjoy! 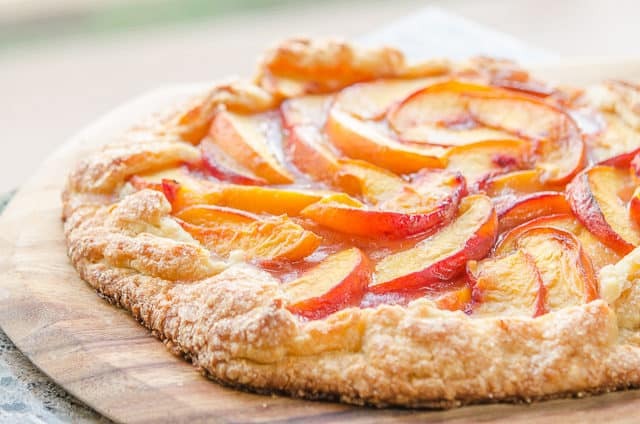 Fresh peach slices are tossed in delicious flavors like brown sugar, cinnamon, and rum, then placed into a simple tart dough, and baked into a rustic Peach Crostata. It's a simple and delicious dessert! 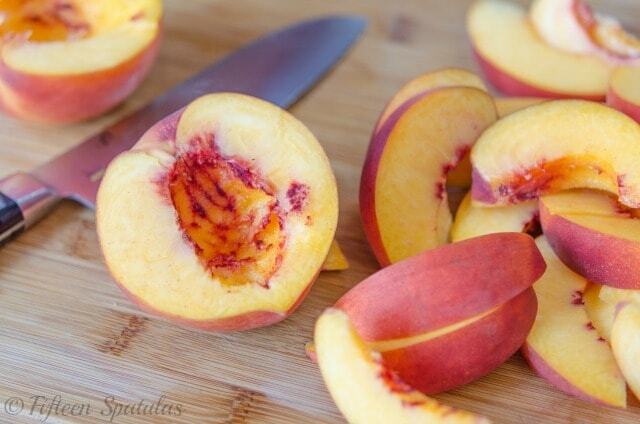 Cut the peaches into quarters, then cut the quarters into quarters, for a total of 16 slices per peach. Toss the peaches in a big mixing bowl with the brown sugar, cinnamon, spiced rum, vanilla extract, lemon juice, and flour. Set this mixture aside. Roll the pie crust out into a big circle, about 12 inches in diameter. Don’t worry if it’s not a perfect circle. Transfer the pie crust onto a rimmed baking sheet. 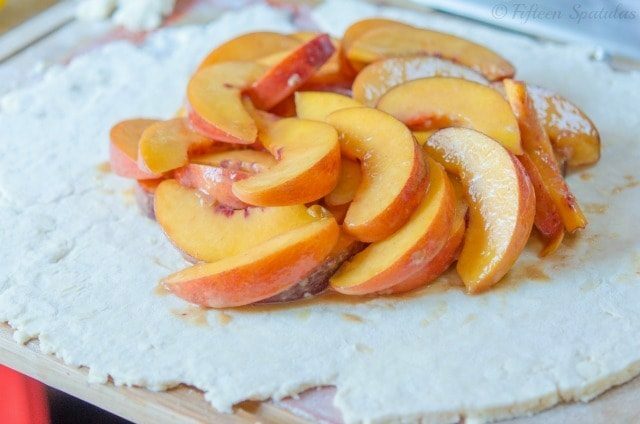 Dump the peaches, along with any of the liquid in the bowl, onto the center of the rolled out pie crust, leaving a 2 inch rim on all sides of the peaches. Distribute the peaches as necessary to form into a relatively flat layer (it’s okay to have the peaches piled up on top of each other). Fold the sides of the pie crust up and over the peaches, then brush the crust with heavy cream. Sprinkle turbinado sugar all over the heavy cream brushed pie crust. Bake the crostata for about 40 minutes until the edges are golden brown and the peaches are bubbling. Serve warm with a big scoop of ice cream, if desired. Enjoy! Post updated in August 2018. Originally published August 2013. This post contains an Amazon affiliate link. Thank you for the inspiration and great recipe! I happened to have some pie dough in the freezer from my last batch, and made this delicious recipe. However I have to confess I used regular sugar instead of turbinado sugar for the crust! What is it and where do you find it? Oh and yes I made a mess with the peach juice when assembling it, but once baked it thickened nicely an you couldn’t tell. Hi Lauren, turbinado sugar is a raw sugar, it is brown in color and has a coarse, crunchy texture, kind of like a crunchy sea salt. You should be able to find it in any grocery store. It makes the crust extra awesome! 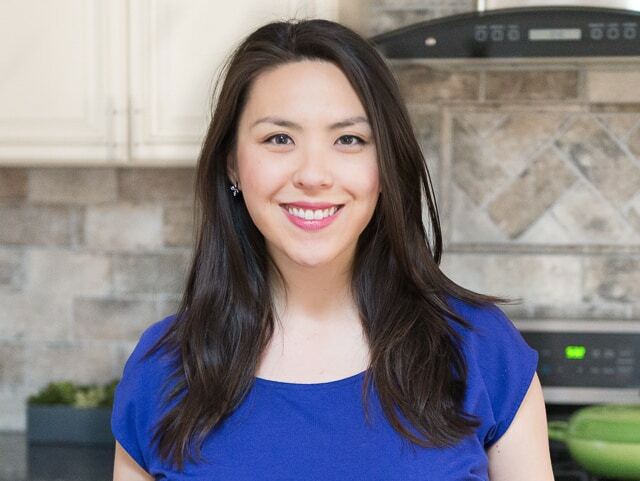 Glad you enjoyed this recipe! I’ve made this tart and the fig almond tart and they are very tasties..
That’s really wonderful to hear!! Hi Loreta, absolutely! That would be delicious. I’ve been waiting for my 1/2 bushel of peaches to ripen and went to the grocery store only to discover some ripe peaches on sale called Peach Pie Heirloom peaches. at first I thought I’d make a pie but then remembered this recipe. Better choice. Fast, easy recipe and a delicious way to enjoy peaches…other than eating them raw fresh off the tree. We all really enjoy this recipe. Ohhhh I tried those too! First time for me. What did you think of them? I don’t know what you paid for yours, but I honestly thought they weren’t worth the price. They were good yes, but I’ve had “regular peaches” that were just as good too. Anyway, glad you enjoyed the crostata! And enjoy those fresh peaches of yours, I bet they’re amazing!